First on the blog this week, the last in my short run of episodes from “This is War”, a Norman Corwin production that helped explain various aspects of the War effort just a few weeks after Pearl Harbor. The series was carried on all four of the radio networks. 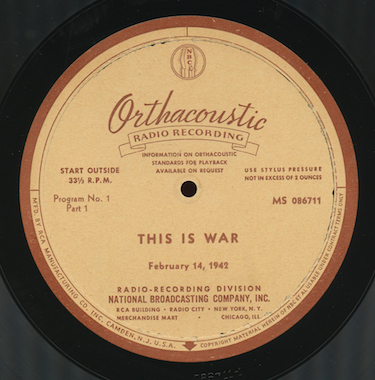 Program 5 in the series was heard March 14, 1942. “The United Nations” looks at our allies fighting the Axis powers. The narrator this week is Thomas Mitchell. Our show was transferred from an original 16” vinyl Orthacoustic NBC-RCA transcription, matrix number MS 086876 and MS 086877. Note that that date is correct on the label, the program number is incorrect. 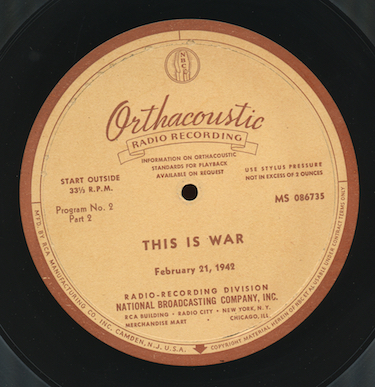 Now, the third program in our brief run of “This is War”, a program written by Norman Corwin and carried on all four networks as an early contribution to the War effort a few months after Pearl Harbor. Program 3 in the series was heard February 28, 1942 and is titled “Your Navy”, dealing with the Navy and Merchant Marine. Douglas Fairbanks, Jr. and Frederick March are featured in the program. The music was composed by Kurt Weill. Our show was transferred from an original 16” vinyl Orthacoustic transcription pressed by RCA-NBC, matrix numbers MS 08691 and MS 08692. 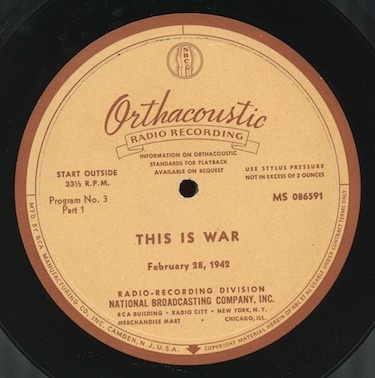 We continue with a short run of a few episodes from Norman Corwin’s series, “This Is War”, carried on all four networks just a few weeks after the US entered World War II. Episode 2, broadcast February 21, 1942 is “The White House at War”. Actor Paul Lukas paints a vivid word portrait of the changes happening to Washington as we shift to a war footing - the program looks not only at the President’s role in the War, but at the immense responsibility for human life that go into the decisions being made in Washington. The program was transferred from an original 16” vinyl Orthacoustic transcription pressed by RCA-NBC, matrix numbers MS 086735 and MS 086736. I believe this is a non-circulating episode of the series. 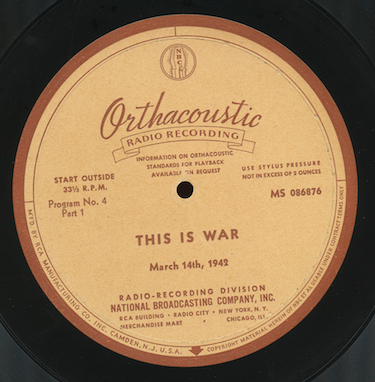 In this post, the first in a short run from the unique Norman Corwin series, “This Is War”. Produced shortly after the US entry into World War II, the series was carried on all four networks and looked at various facets of the fight ahead. This series isn’t quite as well known as Corwin’s other efforts, such as “We Hold These Truths”. It’s just as lyrical, using words, music, and sound in a masterful way to paint pictures in the listener’s imagination. However, it’s rather harsh compared to his other work - it’s propaganda for the War effort that really tries to hammer home the point that this is a fight for the survival of democracy. Program 1 in the series is narrated by actor Robert Montgomery and focuses on why we’re fighting and atrocities committed by the Axis powers. It includes an opening message from President Roosevelt read by Archibald Macleash. The show as carried on all four of the networks on February 14, 1942. This is a transfer of the NBC feed of the program. Our show was transferred from an original 16” vinyl Orthacoustic transcription pressed by RCA-NBC, matrix numbers MS 086711 and MS 086712. Next week - program 2 in the series. A few weeks ago, I picked up a small collection of ten inch home recorded lacquers on eBay. 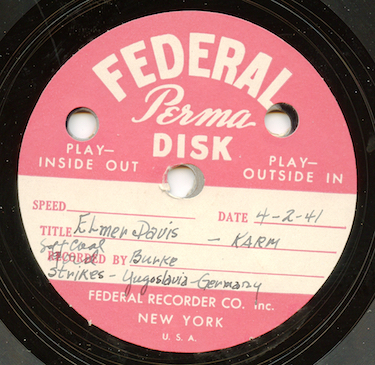 They contained excerpts of CBS News broadcasts dating from early 1941 about the War in Europe. The seller, who picked them up several years ago at a local estate sale, had dozens of these discs and said he had trouble finding anyone interested in them. (He actually threw some away and donated others to someone making an art project of some type.). There’s an archival collection of CBS News programming from this period, primarily “The World Today”, and they said they already had the material. However, if you look at the labels of the discs, most seem to have originated with five minute news updates broadcast on CBS at 8:00 pm Eastern time and aren’t preserved in any other format. We have no idea why a home enthusiast recorded these. A writer for a local paper or college researcher assembling background material? A news fan hoping to document the US entry into the War? A Nazi spy monitoring what the networks were saying about Germany? We have no way of knowing. Since there are so many of the shows, and each is only a three minute excerpt, I decided not to post them individually on the blog. Instead, click here to see a folder where you can download an mp3 of each excerpt and a couple of sample labels. If you’re reading this post months from now, please note that the link to the shared folder may not work - it will only be available for a limited time. 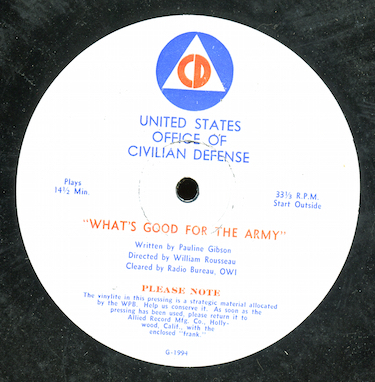 Here’s the final disc in our run of special Civilian Defense dramas distributed by the US government in the early days of World War II to encourage communities to organize and contribute to the War effort. In “Your Neighbors, the Millers”, poor Mrs. Miller had to bring back three cans of grease because she forgot to strain it and Mr. Miller doesn’t know what to do with his radiator. And the kids are using all kind of slang that Mrs. Miller doesn’t like. Perhaps in the Civilian Defense coordinator in the local neighborhood can help. The show was written by Pauline Gibson and directed by William Rousseau. Our mp3 was transferred direct from an original sixteen inch vinyl transcription, pressed by Allied, matrix number G-6000. This is our last show from the series. 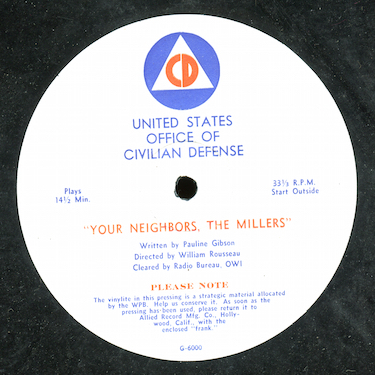 The Office of Civilian Defense has another short drama from the early days of World War II. “What’s Good for the Army” is about what can happen when we don’t coordinate and work together for civilian defense on the home front. The show was written by Pauline Gibson and directed by William Rousseau. Our mp3 was transferred direct from an original sixteen inch vinyl transcription, pressed by Allied, matrix number G-1994. Here’s another episode in a series of dramas produced in the early days of World War II by the Office of Civilian Defense. 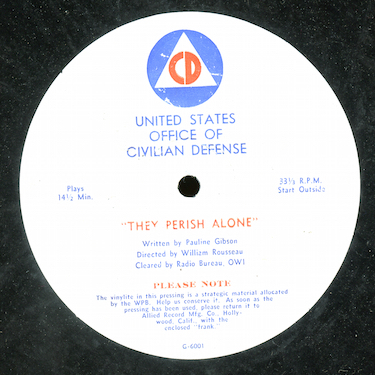 “They Perish Alone” compares the plight of our fighting forces to the dangers faced by early settlers of the American West and how they had to work together. The show was written by Pauline Gibson and directed by William Rousseau. Our mp3 was transferred direct from an original sixteen inch vinyl transcription, pressed by Allied, matrix number G-6001. 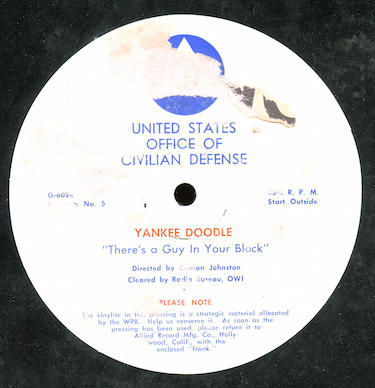 In recent weeks, I’ve posted some shows from a previously overlooked World War II series, “Yankee Doodle”, produced by the Office of Civilian Defense to encourage people to support the war effort on the home front. This week, we kick off a few individual shows, not part of a series, from the same batch of discs. 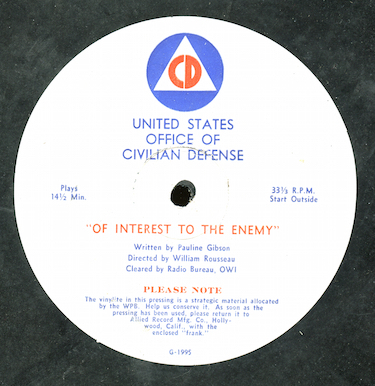 “Of Interest to the Enemy”, is a fifteen minute drama about Larry Crane, “told by the man who wrote his obituary”. The editor of a small-town newspaper talks with different people in the town about the loss of one of their own who died fighting in the Pacific. It prompts the editor to write an editorial about the “Block Plan”, to coordinate neighbors for civilian defense. The show was written by Pauline Gibson and directed by William Rousseau. Our mp3 was transferred direct from an original sixteen inch vinyl OWI transcription, matrix number G-1995. We’ll have a few more shows in this series in the following weeks. Here's the last program in my collection from the 1942 Civilian Defense series, “Yankee Doodle”. Program 5 is titled “There’s a Guy on Your Block”. It’s a story about how a man volunteers and is trained for serving as an air raid warden in his community. The series was directed by Clinton Johnston. Our mp3 was transferred from an original sixteen inch vinyl transcription pressed by Allied, matrix number G-6024. In future weeks on the blog, I’ll be posting some further Civilian Defense shows from the same period that weren’t released as part of a series, but offered as “one off” special programs.